From the first time I tried a bite of this cake, I was sold. It has such a unique flavor and crunch, you won’t forget it. I bought sliced almonds from Menards, of all places and they were great and cheap. I reduced the sugar to 1 cup and didn’t notice. I traced the outside of the flipped over pan on parchment paper, and then cut the inside of that line, for a smaller circle that would fit in the pan. You could also use pecans. A+! Preheat oven to 300°. Grease a 9″ round cake pan and line bottom with parchment paper. Set aside. In a food processor, blend together 1 3/4 cups almonds, flour, salt, baking powder, and baking soda. Pulse it together until the almonds are finely ground. Pour mixture into a mixing bowl. In the same food processor bowl, combine eggs, 1 1/4 cups sugar, lemon zest, and almond extract until the mixture is pale yellow. Pour in the melted butter and oil, while the food processor is running. Pour this mixture into the bowl with the flour mixture. Stir until combined and pour into the prepared pan. In a small bowl, mix together the remaining 1/4 cup almonds and sugar. 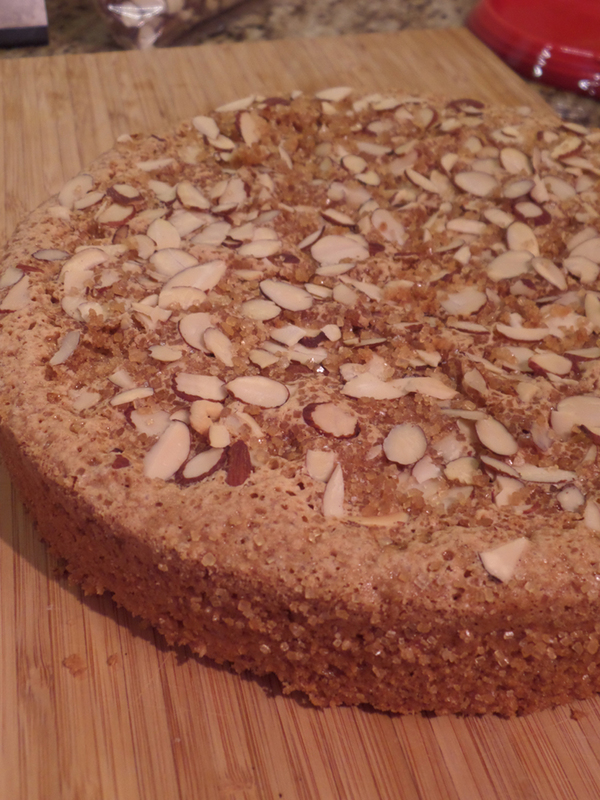 (*I used Turbinado sugar for the top of the cake for that added crunch, it was great!) Sprinkle this on top of the batter. Place cake in oven and bake for one hour. The top will bounce back and a toothpick inserted into the center will come out clean. Let it cool for a few minutes in the pan, then turn it out onto a cooling rack. 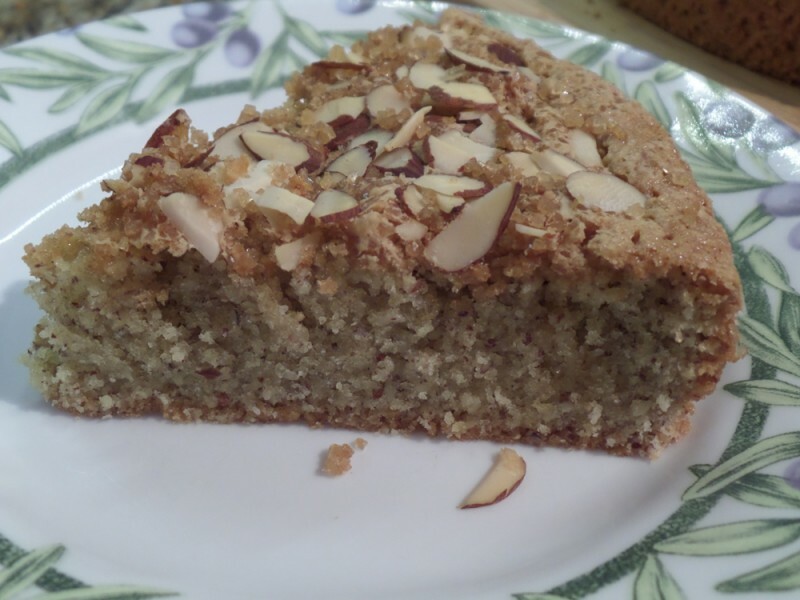 (Turn cake onto plate, peel off parchment paper, then place on rack, almond side up. Let cool.